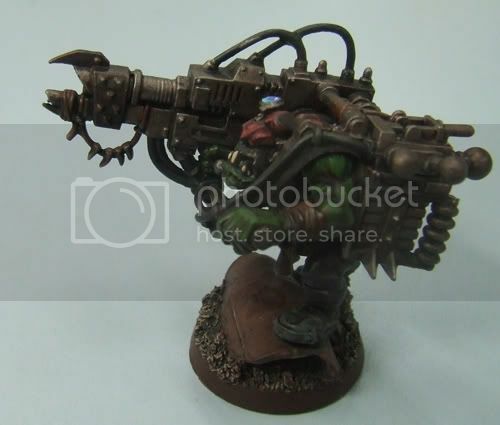 After spending a bit of time speed painting my orks, quite a few people have been asking me about the techniques I've been usind to speed paint my orks. 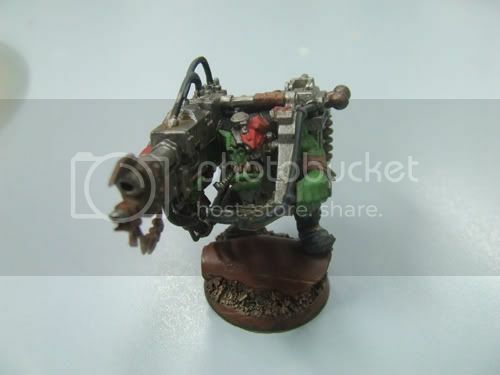 Over a period of about 4 weeks I've now painted 160 orks of various types, mainly base troops, but also commandos, meks, lootas and burnas all using the same method. I worked out this method with two things in mind:1. Speed2. Decent looking models in minimal timeSome of the methods I use are monotonous, and require patience at the level that I have used them. But this doesn't mean you need to paint 40 models at a time. You reduce the number of models to suit your patience level.When I started this army painting project I needed to think through what I would do and how I would approach the painting. The constraints I placed on the painting procedure are as follows:1. No eyes - shadowed sockets2. Minimal colours - main black clothing with patches on some of the troops to break up the colour3. 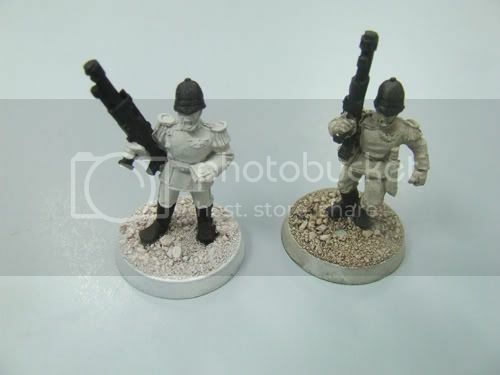 Few extra details such as coloured helmets etc. to make the colour pop out in squads but not as individuals4. Simple but effective bases5. Minimal highlights - let the shades do most of the work (reverse highlighting)6. Dips - shading done mostly with dipsHere are some pics of a model that I did prior to dipping the model. The main rule here is to decide on the colours you want, do them neatly and don't focus too much on the little stuff. I used drybrushing (gasp!) for some highlights to lift the edges, and edging for some of the other edges, but as a main rule I didn't do much highlighting at all. As you can see - the job is very basic. 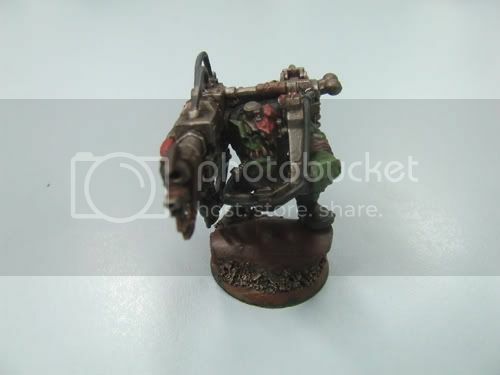 Quick flesh in Goblin green, quick metals in Boltgun metal, straps in graveyard earth highlighted with a lighter version, red on the extras, grey drybrush, drybrush the base with appropriate colours and add some details to straps and the like. Nothing difficult.The next part is to make sure you've got your dip ready. The dip that I used is a mix up of a cheap artist acrylic paint. I made up two pots, one of a mid brown and one of a black. The consistency is probably about that of watery milk, approximately 20 parts water to 1 part paint and 1 big drop of detergent to break down the surface tension. I mixed this up into an appropriately sized container ( for the most part I used a medical specimen jar - fresh and never used prior!!!) that was large enough to dip an ork model into. I used a mix of artist acrylics, no particular brand, and they were folk art paints. Just whatever mix of colours I needed to get an approximation. And keep the colours on hand so that you can mix up more later - you'll need it!Here is a test of the brown colour and what it should look like (approximately) when you get the right consistency. This is done using the brown colour, and it's similar coverage for the back. None of this is an exact science, we are dipping after all!!! 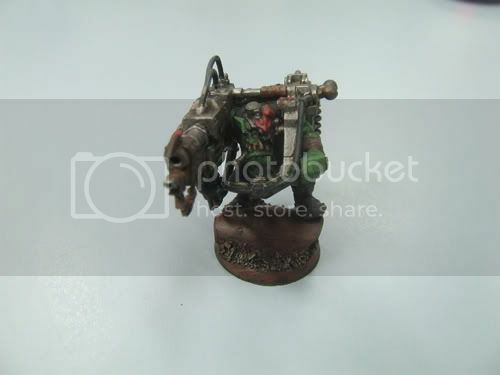 So now here I begin with the dipping of the orks. 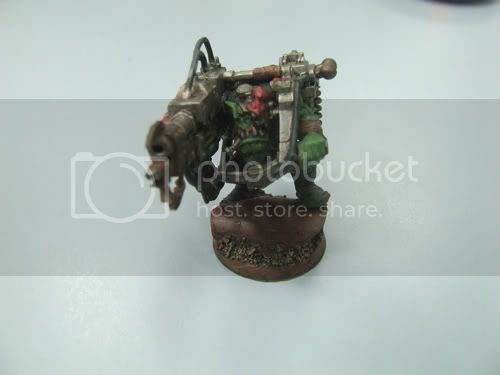 The picture I showed above was a different ork than the one I will show you dipped. This is mainly because I did the first layer before taking the picture! So the one earlier is just for indication of the brightness of the original colours.The first two pictures are the first two dips. These are in the brown dip, I give them a quick shake to remove excess fluid, but then let them model completely dry before dipping for the seond time. One thing that I should mention here - superglue is better for the bases than PVA white glue. White glue returns to liquid if you mix it with water, but superglue will stay in it's dried form. So my advice is - base with superglue if you are going to dip like this. At this point, the following two pics are done with the black dips, two applications. You can see at this point that the details are getting quite dark now. After these four layers have dried I then painted some of the new GW washes over the metals and some of the shadow areas. 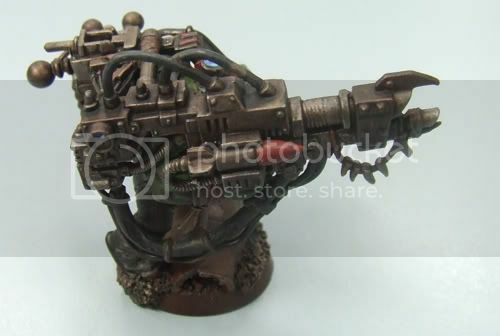 This model I used Ogryn flesh followed by Devlan Mud. Here are the pics between each layer. And then Devlan mud. The extra details were added after the wash was dried, I added another slight highlight on the teeth, lens on his head and that's about it. 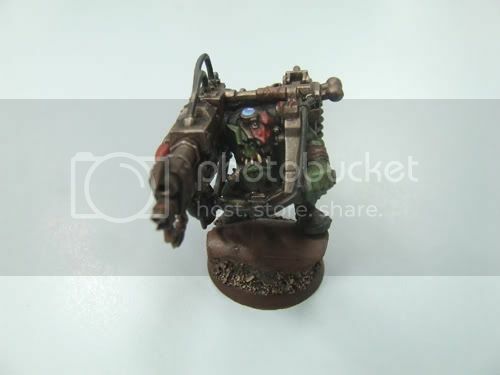 Here are a couple more photos to show the all around effect that this speed painting method gives: And a pic of the squad that this one was a part of all painted up: Hope you find this useful. 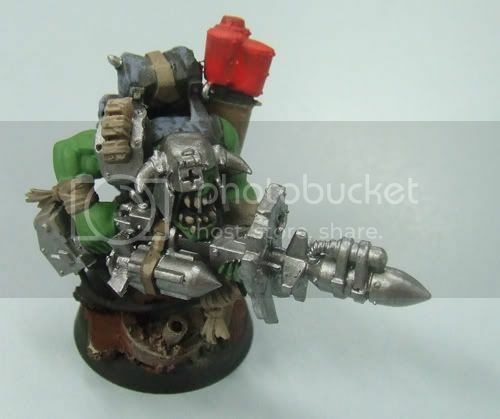 It has helped me so far to get almost all of the Ork horde painted up and they look nice and dirty, just like any good ole looting self respecting ork warmonger needs to look. 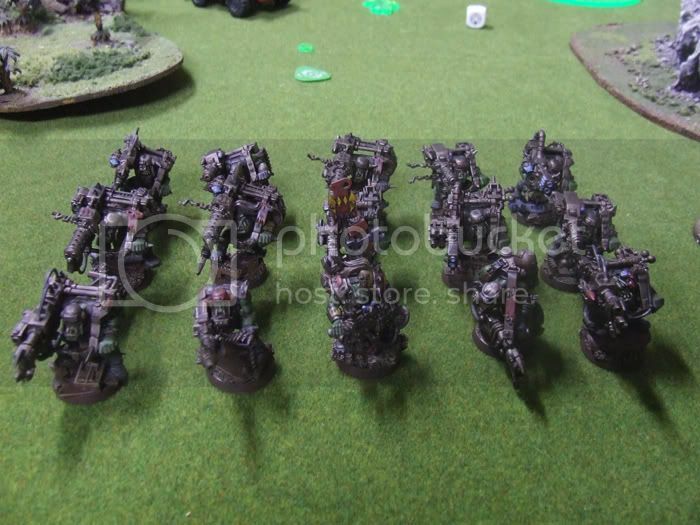 And it does look very effective when you have 160 freshly painted models arrayed in front of you! I'm quite happy with how these guys have turned out, and I hope that you find this article useful.